So I hankered to replace them, but never actually did anything about it. That was until on the way home from mum's yesterday, hubby told me he had brought home a bookshelf and that I might have to put up with it blocking the way until he decides what to do with it. Of course, once I saw it I squealed with delight, it was just the kind I had wanted. I just love my husband's removal job. It was unused and free. So of course I wanted to keep it. Ah the joys (and pains) of organising books! The new shelf looks great and you did a excellent job of arranging the books. I never have enough bookshelf space in my house, subhan Allah. well done was worht the late nice so much neater and compact looks sturdy too. I don't belive it took every thing from the old one, i think you got rid of more than you saying opps those poor kids. I am the same clear out when their out! That is a great change. 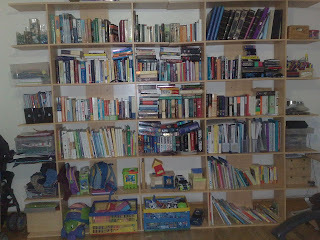 Who would have thought a different bookshelf could make things so much neater? Great choice!